Last updated 14 October 2013 . By Dan Winters. 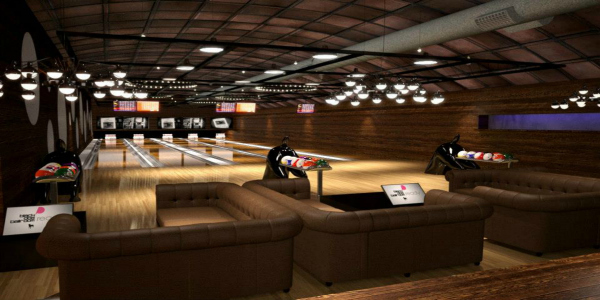 As the baby of the litter of the Black Dog Ballrooms that now run throughout Manchester city centre, Dog Bowl boasts cool, speakeasy inspired stylings, a fantastic location just off Oxford Road and five polished bowling lanes that no other bar in Manchester can compare with. This puppy’s Dog Bowl is certainly gleaming, shiny and full of treats. With a sleek glass wall front, and being situated underneath Manchester’s Oxford Road train station, Dog Bowl manages to combine the great natural light that comes in from the street with the thrilling, subterranean feeling you get as you delve deeper into the bar. As you enter the venue, your waiter or waitress will meet you, with my waiter for the day being the graceful Mike, and usher you into either one of the cosy booths or stylish window tables. The interior is striking semblance of red and black chairs and tables, and bare bulbs that hang down from brightly-coloured wires. With art pieces on the wall, the luminous black tiles behind the bar and the dark wood panelling that stretches from the kitchen beside the bar to alongside the lanes, it’s hard not to imagine yourself inside one of the dangerously exciting New York speakeasies from which the venue takes its inspiration. 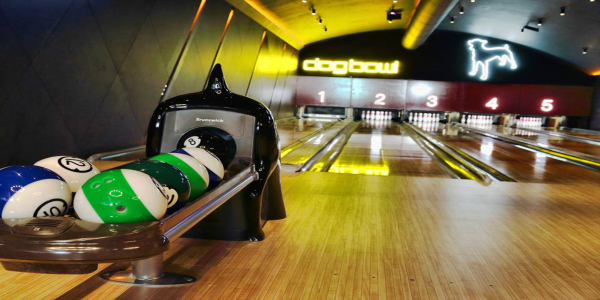 The unique selling point of Dog Bowl is the five glistening, full-length bowling lanes, complete with bowling balls styled after American pool balls, and ball dispensers shaped like the Black Dog himself: Bruce the Patterdale Terrier. With deals that reward three consecutive strikes, otherwise known as a ‘Turkey,’ with a game for just a penny, and a high score competition with a cash prize, Dog Bowl rewards and encourages great bowlers as much as it does those who just want something unique to do on a night out. The sophisticated design of Dog Bowl breeds a similarly sophisticated atmosphere that makes a perfect backdrop for lunch or for a great night out, with the cacophony of sound from the crashing of pins and celebrations of strikes and spares. The music ranges from indie rock to foot-tapping instrumentals, but stays catchy and head-bob-inducing all night. Regardless of when they come, everyone who comes to Dog Bowl are after the same thing; something unique. On my visit, my partner-in-crime and I both ordered something of the new Sunday Lunch menu that offers either: Smoked Chicken, Pulled Pork or a Smoked Beef Brisket, each coming with all of the the trappings of a traditional Sunday Roast (£12 each). 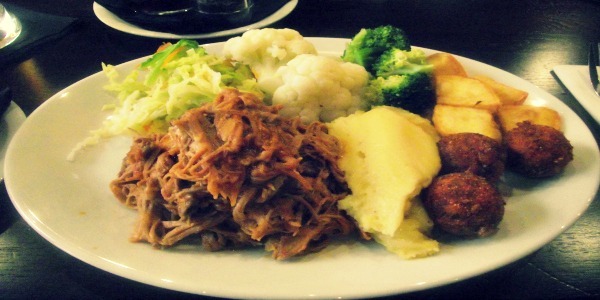 Whilst I chose the smoked half chicken that came complete with a bed of vegetables and the traditional roast potatoes, my friend went for the Pulled Pork roast, complete with incredible apple sauce. Both of our meals came with all the sides that you'd expect, and some hushpuppies as well; something our waiter described as cornbread dough balls dipped in batter, with its name coming from their usefulness for keeping boisterous dogs quiet - and now hungry bar patrons too. 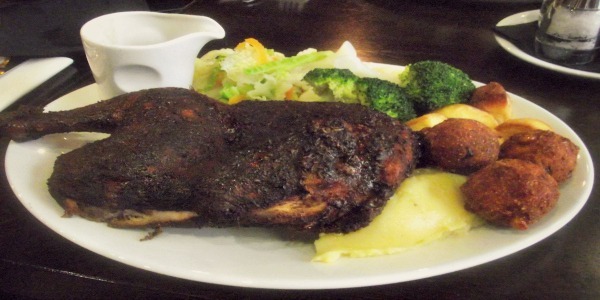 Our dishes were delectable, with my smoked chicken taking up half the plate with its beautifully cooked skin and meat, and the pulled pork disappearing quickly, leaving only the remnants of the sweet gravy. Alongside the food came the drinks that range from the five on-draught lagers that start from £3.60, the huge cocktail menu that makes the Black Dog Ballroom some of the most popular bars throughout Manchester that range from £6.50 single cocktails to huge sharers, and the Lattes that were specifically recommended from our waiter. After a Hazelnut and a Caramel latte (£1.80), both my friend and I had to admit, they were the pick of the bar's huge drinks range. And should you pick one, or maybe even a few of, of Dog Bowl’s amazing cocktails, just make sure you remember to let go of the bowling ball! With one of the most unique Sunday Lunch offerings of any of Manchester’s bars, it’s hard to not recommend Dog Bowl should you ever be in the area on a quiet Sunday afternoon. 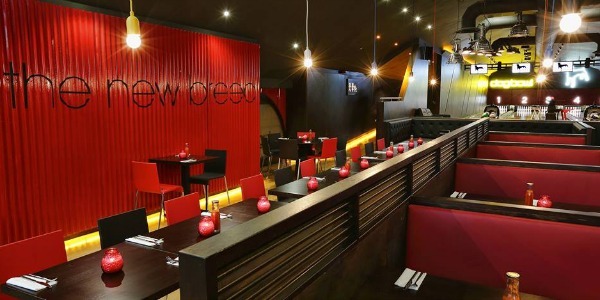 For those looking for a night out to remember with a group of friends, there’s nowhere in Manchester quite like Dog Bowl; just make sure to book your table and lanes to avoid the usually large waiting times.